The role of Tevye is played by Steven Skybell. 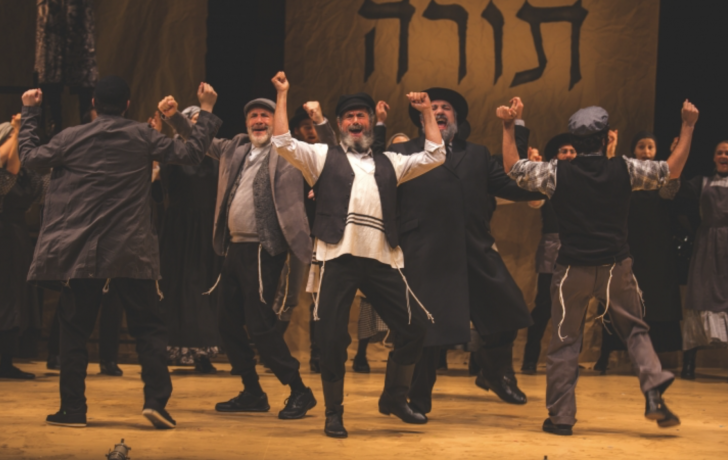 National Yiddish Theatre Folksbiene’s Fiddler on the Roof has extended its run once again. Performances will continue at the Museum of Jewish Heritage until December 30. The production, directed by Oscar and Tony Award-winner Joel Grey, is in Yiddish with English and Russian supertitles. Based on a short story by Sholem Aleichem, the musical opened on Broadway in 1964 and ran for almost eight years and continues to be performed around the world. Steven Skybell leads the cast as Tevye; Jackie Hoffman plays Yente and Jennifer Babiak is Golde. The show features a book by Joseph Stein, a score is by Jerry Bock, and lyrics by Sheldon Harnick. Harnick and Harold Prince, the musical's original director, were consultants on the project. Tickets are available at www.nytf.org.